What milestones did Voyager 1 accomplish? Voyager 1 was launched on September 5, 1977, from Cape Canaveral, Florida, on a Titan 3E Centaur rocket. Even though it was launched a few days after Voyager 2, it was sent on a faster trajectory to the outer solar system and thus arrived first. 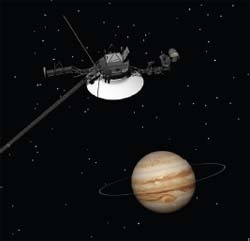 In 1979 Voyager 1 passed by Jupiter and took pictures of the planet’s swirling clouds and Galilean moons. It discovered volcanic activity on Io, and found a previously undiscovered ring around Jupiter. At its closest approach on March 5, it was 217,000 miles (349,000 kilometers) from the center of the planet. Voyager 1 successfully used Jupiter as a gravitational slingshot to get to Saturn. It flew by Saturn in November 1980, with the closest approach on November 12 of 77,000 miles (124,000 kilometers). It detected the complex structure of Saturn’s rings, and studied the thick atmospheres of Saturn and its moon Titan. When it flew by Titan, the gravitational slingshot it received flung the spacecraft out of the ecliptic plane, sending Voyager 1 upward and away from the planets. An artist’s rendition of Voyager 1 approaching Jupiter.